"I consciously elevated the energy field and entrained her to a theta state." 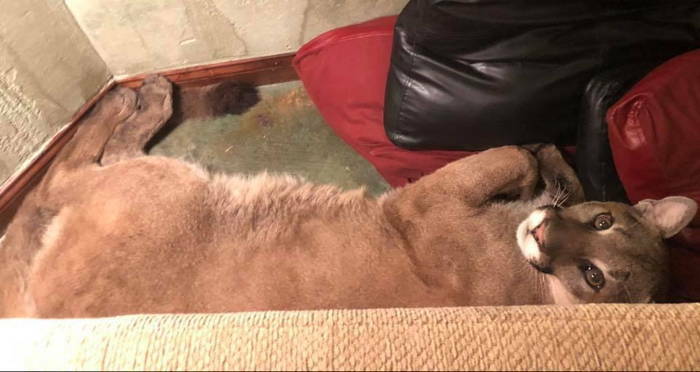 A woman in Oregon recently discovered a mountain lion in her living room, which would naturally freak out most people. But instead, this woman says that she “communicated trust through blinking” and used telepathy to get the feline safely out of her home without harming anyone. It may sound like a far-fetched story, but the woman’s Facebook post explains just how she apparently used these strange methods to get the creature out of her home. Lauren Taylor, who lives in Ashland, Ore., said that the cat spent more than six hours relaxing behind her living room couch. Taylor then explained that when her housemate saw the mountain lion and shouted, it was startled and became agitated. So in order to calm the animal down, Taylor “consciously elevated the energy field and entrained her to a theta state” so that it wouldn’t harm anyone. She said that once the energy shifted, the mountain lion was able to calm down and eventually fall asleep. In her post, Taylor included several remarkable images of the mountain lion snoozing behind her couch, looking relaxed as can be. Taylor believed that the cat felt safe in her home and had no inclination to leave, so she let it rest and continued to use her blinking technique to communicate trust and keep the mountain lion under control. She said that cats are “extremely psychic and perceptive” and that the animal “could have been dangerous in an energy field of fear or anger.” And so, she trusted that as long as she kept the energy in the room positive, nothing dangerous would happen. But after the cat spent hours resting, according to Taylor, she needed to figure out a way to prompt it to leave without startling it and creating a potentially dangerous situation. In fact, Taylor was able to take a video of the mountain lion leaving her house to display just how intuitively it was able to find its way back into the wild. Taylor said that she “meditated on how to get her to leave her safe spot behind the sofa” — and apparently her method worked. Though this situation was tense, mountain lions don’t typically attack humans. In fact, a mountain lion attack is pretty much unheard of — but that doesn’t mean that it can’t ever happen. Just recently in Washington state, a mountain lion stalked two mountain bikers and killed one of them, leaving certain wildlife specialists perplexed. And Taylor certainly took some strange steps to ensure that she wasn’t a one-in-a-million victim. Next, read about the lions who ate poachers alive in South Africa. Then, read about some of the most fascinatingly weird animals from around the world.